I know it's Wednesday and everyone is starting to lose their minds, so here's a little something to help you get through the week. I wanted to share something that I learned about in my African art history class. I've really loved this class so far because I knew a lot about art in Europe coming into the class, but very little about Africa with the exception of Egypt. 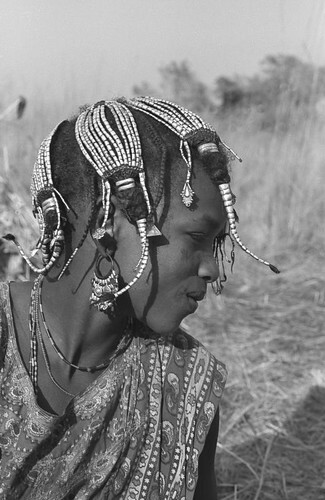 The tribe that we talked about this week is the Fulani tribe. Just to give a bit of background, they used to live in the Sahara, before it was a desert, and they began to migrate east from there. They are primarily a nomadic pastoralist people. By the way, for any of you 'Berg students, Denise McGlynn, who you may have read about a few posts back is here at Muhlenberg tomorrow by the main entrance at Seegers so make sure to check her out if you didn't get to visit her last time! If you want to know more about here and see some of the stuff she makes, click here. By the way, it turns out the e-mail address on here wasn't forwarding properly so now any e-mails you send to keepcalmandchiffon@gmail.com should get to me without a problem. I think that's it for now! Here's to Friday almost being here!